The trend toward a more competitive electricity market has led to efforts by the electric power industry to develop advanced efficiency evaluation models that adapt to market behavior operations management. The promotion of the operational performance management of the electric power industry plays an important role in China’s efforts toward energy conservation, emission control and sustainable development. Traditional efficiency measures are not able to distinguish sales effects from productive efficiency and thus are not sufficient for measuring the operational performance of an electricity generation system for achieving its specific market behavior operations management goals, such as promoting electricity sales. Effectiveness measures are associated with the capacity of an electricity generation system to adjust its input resources that influence its electricity generation and, thus, the capacity to match the electricity demand. Therefore, the effectiveness measures complement the efficiency measures by capturing the sales effect in the operational performance evaluation. 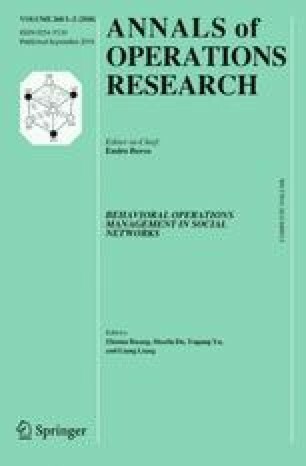 This study applies a newly developed data envelopment analysis-based effectiveness measurement to evaluate the operational performance of the electric power industry in China’s 30 provincial regions during the 2006–2010 periods. Both the efficiency and effectiveness of the electricity generation system in each region are measured, and the associated electricity sales effects and electricity reallocation effects are captured. Based on the results of the effectiveness measures, the alternative operational performance improvement strategies and potentials in terms of input resources savings and electricity generation adjustments are proposed. The empirical results indicate that the current interregional electricity transmission and reallocation efforts are effective in China overall, and a moderate increase in electricity generation with a view to improving the effect on sales is more crucial for improving effectiveness. We gratefully acknowledge the financial support from the National Natural Science Foundation of China (Grant Nos. 71471018, 71101011 and 71521002); the Ministry of Science and Technology of Taiwan (MOST103-2221-E-006-122-MY3); and the Basic Scientific Research Foundation of BIT (20152142008). We also thank the reviewers for their valuable and constructive comments. Cook, W. D., Du, J., & Zhu, J. (2015). Units invariant DEA when weight restrictions are present: Ecological performance of US electricity industry. Annals of Operations Research. doi: 10.1007/s10479-015-1881-x.